To work with CHALK PAINT™ is not hard at all, and during the process you will discover the many possibilities of this fantastic paint. First of all: you don't have to sand the surface. Even a primer is not necessary.Only degreasing the object is a lust. The you can start painting. One can use CHALK PAINT™ on virtually any surface. To protect your painted furniture op other objects against moisture and dirt, you can use soft wax or varnish (water-based) by Annie Sloan. This is recommended. You want to know what all the possibilities are and to try CHALK PAINT™? Stop by for a chat. 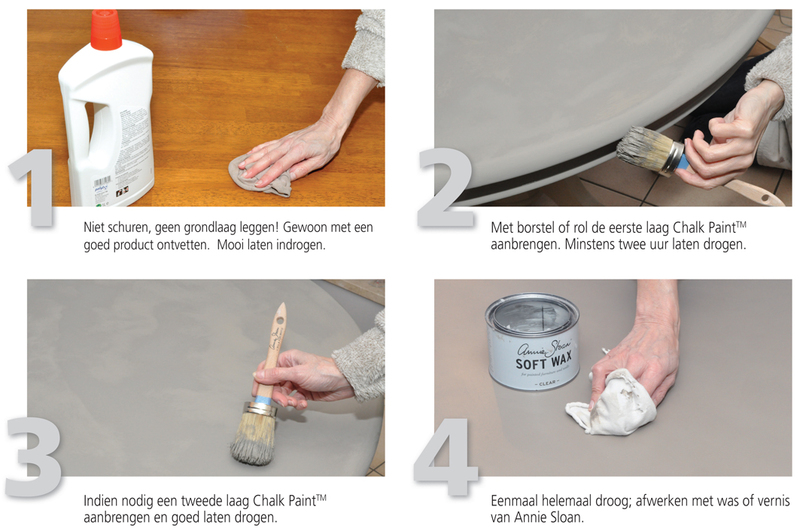 We also organize workshops (in Dutch) on a regular basis (usually in the evening) to learn the different techniques in CHALK PAINT™ and to try them out on the spot.